The PediaGraph Immobilizer (PGI) has received high marks after being field tested at LeBonheur Children’s Medical Center. 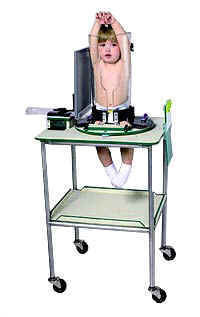 Many of the features were developed in response to welcome suggestions from the professionals who actually use pediatric x-ray positioners on a daily basis. As infants don’t understand the radiographic process, the fast positioning and easy - adjusting features of the PGI save time and tempers and get the job done properly. The PediaGraph Immobilizer incorporates ergonomic engineering features for operational ease and patient comfort. The PGI imposes no radiation risk to medical personnel. The positive locking turntable helps to eliminate motion in x-ray films. The turntable rotates on non-stick glide pads for easy positioning. Positioning of the film cassette is fast and fully adjustable vertically and horizontally. Specially designed upper body supports are furnished in two sizes to accommodate the average infant and toddler.